After you marinate meat, you may want to use the marinade to baste the meat as it cooks, or as a sauce on the finished dish. However, once a marinade or sauce has come into contact with raw meat, it is no longer safe to consume. But this doesn't mean that you have to throw it out when you are done marinating. Learn the safe way to use the marinade rather than toss it. Meat and fish all have germs on their surfaces that have contaminated the marinade once you use it to marinate the protein. You might think that because your marinade has acid or alcohol in it that this will kill the germs. Unfortunately, that is not the case. Enough contamination remains that you can get sick from a foodborne illness if you use the marinade for basting or a dipping sauce. Pour any marinade or sauce that you have used on raw meats into a saucepan and bring it to a boil. This needs to be a complete, rolling boil to ensure that all the bacteria is killed. Remember that foodborne bacteria die at 165 F (75 C). Once the marinade has reached a boil, remove from heat and allow to cool. The marinade doesn't need to cool completely after boiling if you want to use it for basting, as bastes can be applied hot if your baster can handle it. Now your marinade or sauce is safe to use as a basting sauce or mop right up to the moment you remove foods from the grill. 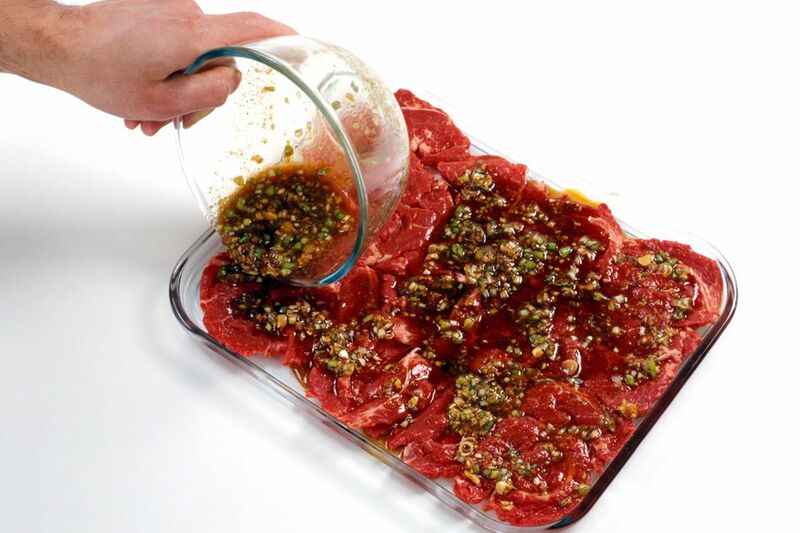 Not all marinades tolerate being boiled well, so taste your boiled marinade before you use it again to make sure that the flavor has not been altered. Most marinades will be unaffected by the heat, but some may develop an unappealing flavor. You might want to adjust the acidity, for example. Also, sugars burn at 265 F (130 C). If the marinade contains sugars, avoid a rolling boil for more than a few minutes to prevent burning. Marinades that are boiled for safety can be used as an ingredient in sauces or additional ingredients can be added as desired. You may also need to add additional liquid to the marinade since boiling will also reduce and thicken the liquid. When adding liquids, don't just water it down, but add those liquids that made up the marinade to begin with. This preserves the flavors. While you may not feel right about tossing the marinade, that is the safest choice. It is better to make up a larger volume of the marinade and separate an amount you will use for basting or to make a sauce. Then you won't be tempted to forgo boiling it, cut short the boiling time, or change the flavor.